Oaxaca is a lively, charming city. Conveniently (or confusingly) it's also the name of the state where the city is located. Think Oaxaca, Oaxaca, Mexico. On days when we weren't walking the streets, visiting the mercado for fresh fruits and veggies or partaking in the daily activities in the zocalo, we ventured outside the city to other parts of the state for some unique adventures. 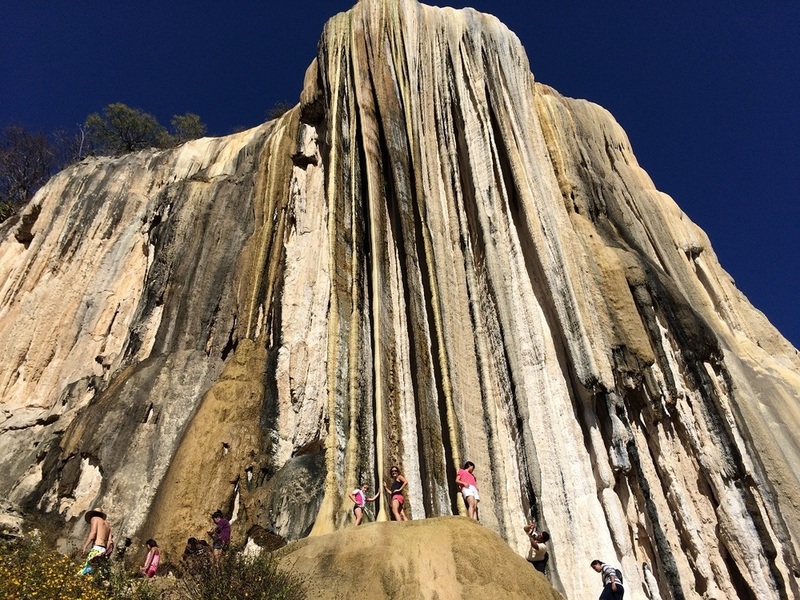 Located 90 minutes outside of Oaxaca City, near the town of Mitla, Hierve el Aqua is well worth the drive. 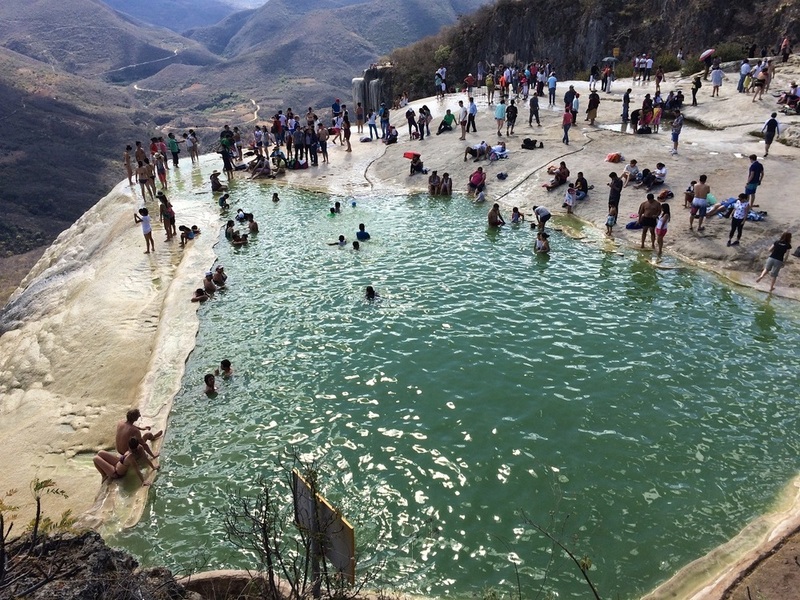 This set of naturally flowing springs bubbling up through limestone is a big draw for tourists and locals. Even though the name implies (okay downright states) the water is boiling, the water is actually freezing. It is so cold that both Mickelle and Tag refused to get more than their toes wet. Ela and I swam in the waters with the locals and several Europeans. The coldness was refreshing. But one can only swim in cold water for so long. Still to come was an even more impressive site. The mineral thick water drips off the edge of the cliff and down a few hundred feet. Over eons, this trickle has turned into a prodigious rock formation that reminded us of cave stalactites, but without the cave. These limestone waterfalls are a stunning vision. Be sure you go on the hike down to the bottom of the waterfall. It's a self guided hike. You'll be awestruck. Bring drinking water and good walking shoes for the hike. It's a steep path for both kids and adults. Try the molettes (think open faced Mexican sandwiches) at the top near the entrance. Cheap and good. 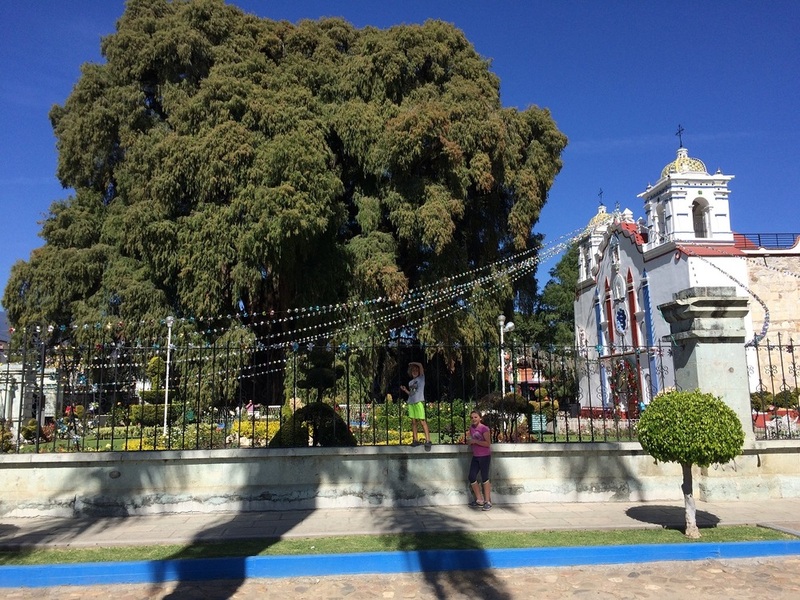 About 10 minutes outside of Oaxaca City, in the town center of Santa Maria del Tule, is a grand tree. The Arbol del Tule is a Montezuma cypress (Taxodium mucronatum). It's claim to fame is that it reportedly has the the stoutest trunk on the planet. It was last measured in 2005 at a circumference of 42.0 m (137.8 ft). To put this in perspective, if the tree were cut down, laid on its side and unrolled, the outer ring of the trunk would be the equivalent length of a 13-story tall building. The trunk is so large that scientist thought several trees had grown together into one big tree, but DNA evidence has proven that it truly is only one tree. There's not a lot to do in Santa Maria del Tule other than marvel at this giant tree. And marvel we did, for about 30 minutes. It may seem like it's "just a tree", but to stand it its shadow and fathom it's size is inspiring. 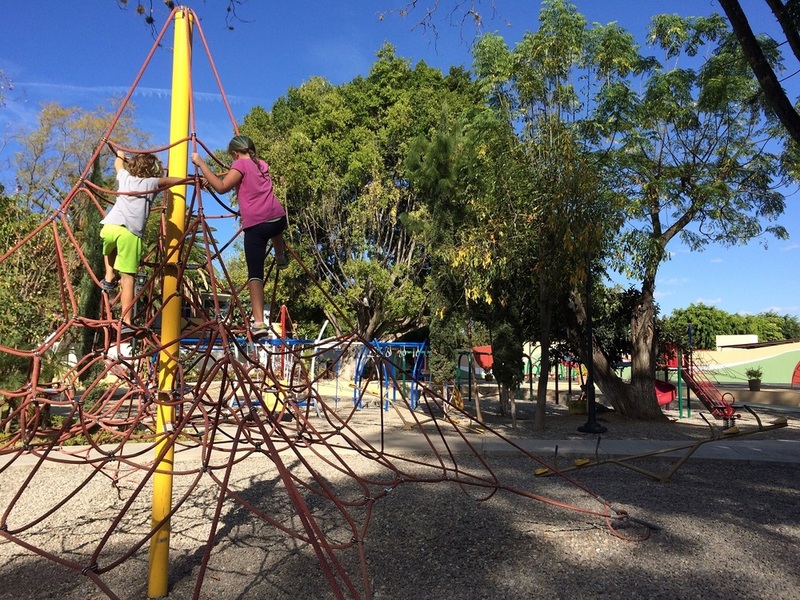 With much of the day left, Mickelle and the kids spent several hours at a big, public park that they passed on their way out of town. Having noted its location, they returned to the park after visiting the tree. We haven't seen many nice parks outside of the US, and it's one of the things we miss most. We returned to this park other days as well. Monte Alban is a pre-Colombian archaeological site (i.e. another set of awesome ruins) located about 20 minutes outside of Oaxaca City in the municipality of Santa Cruz Xoxocotlán. 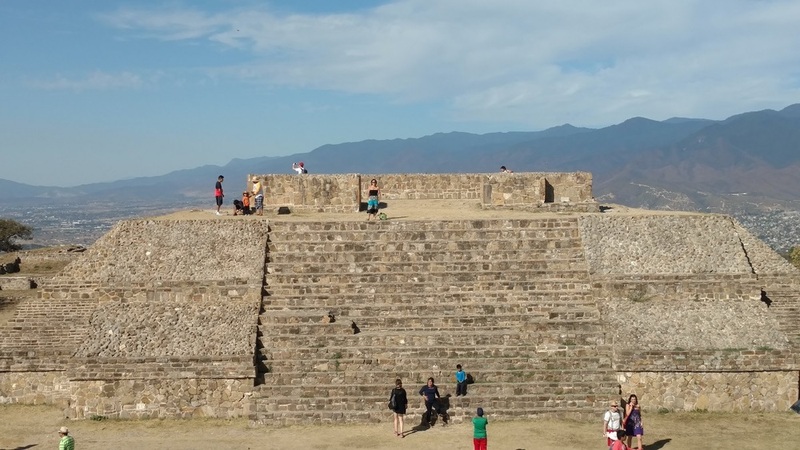 Founded around 500 BC, Monte Alban is perched on a low mountainous range overlooking what is now Oaxaca City. There are some pretty spectacular views of the city from the top. 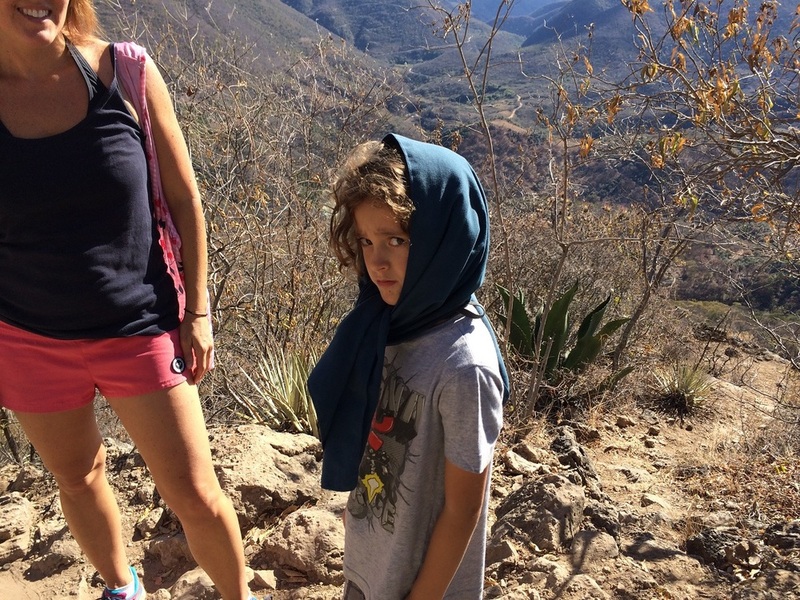 We hiked among the ruins for almost two hours until the kids, who have been to "too many ruins", blew a gasket. While they thought the first ten minutes were neat, the rest of it felt like more of the same - old buildings under a hot, hot sun. For the rest of the family, the various archaeological sites are all starting to feel similar, even though they are all very different. That said, they were stunning, and there are very few areas where you can't explore throughout this site. 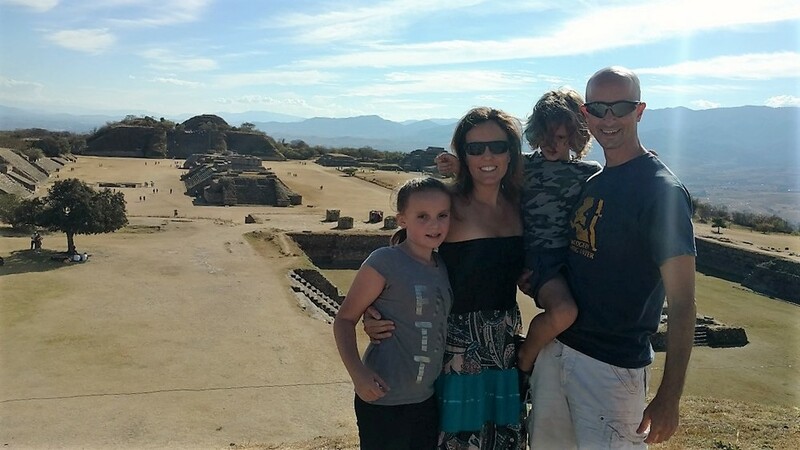 Visiting Monte Alban is a must if you are in the area. Oaxaca City has two movie theaters and both are nice. Most of the movies were originally produced/recorded in English and have been dubbed in Spanish, but both theaters had a few playing in English with Spanish subtitles. As long as you can ignore the Spanish text on the screen, it's just like seeing a movie in the US. And much cheaper. The rest of the theater was pretty much what you'd expect except for the the fire gear. In case of fire...please suit up and do your part. The condiment bars are always a treat. It's not unusual to see people putting ketchup and mayonnaise on pizza or corn. Want to be a fire fighter? Hang out at the theater and wait for an opportunity to try your skills. 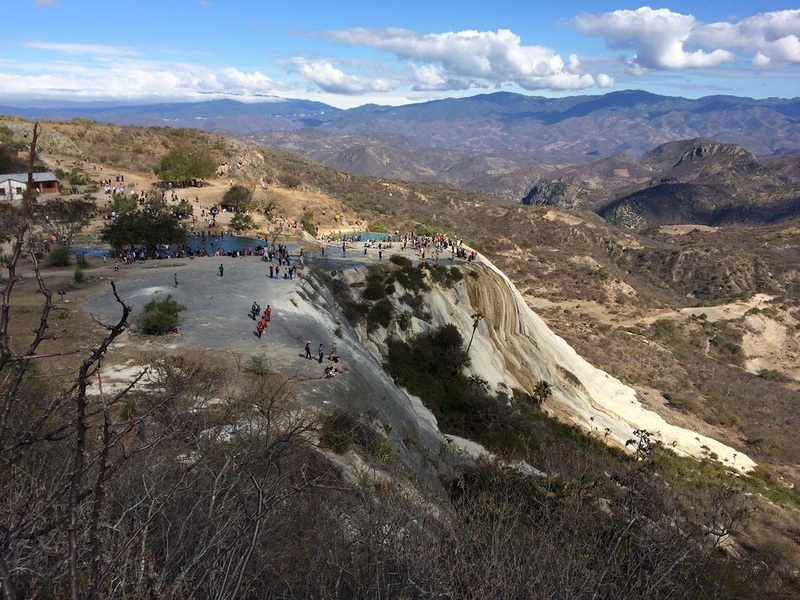 While there is a lot more to do in Oaxaca, these were the family highlights. Ela and Mickelle would add Starbucks as another highlight since there was a store 1.3 miles away from our apartment. They woke up several mornings and enjoyed a brisk walk to get their favorite morning drinks. On this visit, we got to know this city well, and it is no longer a blur. Three weeks was the perfect amount of time for us.